I introduced the The Atlantic's Reform pamphlet ("22 pages...") by focusing on the presentation of content. But, I regret to say I left out what might have been the most important part: the "cover" of the section. It's a TEST BOOKLET! Surprised? Now, this is clearly ideological content on all levels. There is ZERO subtlety here. How is this possible? For whom are these articles written? Surely these writers and these editors must realize that they are writing a very obvious form of "persuasion" empty of anything deeper than bald ideology. If I assume that, then what? I think it's necessary now to approach much of this as if it were not solely propaganda. What I mean is, our first examination, after acknowledging the bald intent, must be to see these pieces as an attempt of offer coherent instructions. 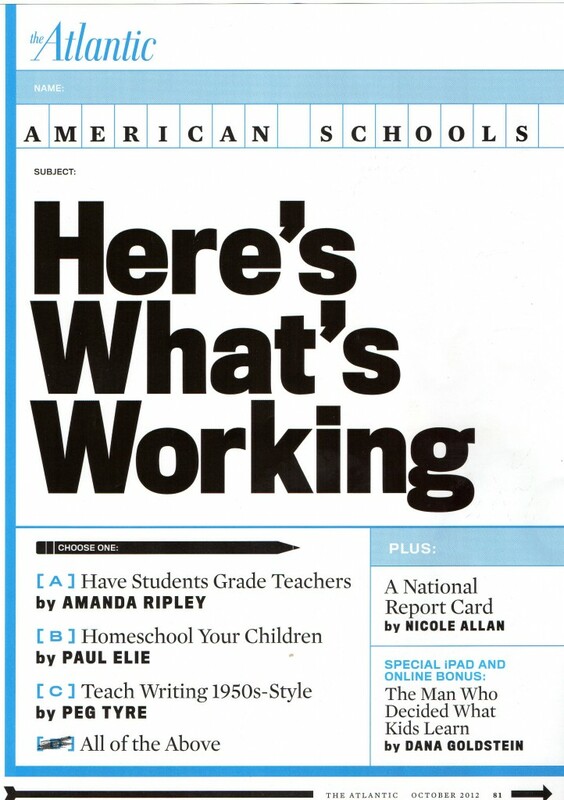 So, these pieces in The Atlantic Monthly must be seen as instructions to its readers to "change" what Paul Elie, in letter B above, calls the "cult, creed, and dogma of public school." That is, re-describe the institution and then act appropriate to those instructions. This is propaganda, yes, but like Peckham's description of mathematics, it is empty of content. That is, the content consists of directions which are persuasive but not honest in that they don't point to the goal behind the instructions. That is to say, authors of propaganda want you to do something, think something, feel something exactly as instructed but not for the same reason that they wrote the propaganda. They are writing to create a coherence on a lower level while they seek to operate within a distinctly different coherence at a higher level of culture (i.e., more educated, greater wealth, Caucasian, etc.). Management rules and labor rules are an example. Celebrity drug use and criminal drug laws for the urban poor is another. There must be a reason why some people cannot do a thing while another group is allowed to do that same thing and often to greater extremes. This is why an oxycodone addict like Rush Limbaugh is allowed to blather on about urban pot-smokers and this is considered "appropriate." Dickens pointed to this over an over. Examples are legion in Hard Times, but a clear instruction is found in chapter eleven, "No Way Out," when Stephen Blackpool asks, hat in hand, advice of Mr. Bounderby--factory owner and Stephen's boss--as to how to attain a divorce. Blackpool responds to Bounderby's answer by noting the inconsistency and incoherence of the social instructions while Bounderby insists on it as a coherence. It is often shocking to me that this is still our preferred mode of social management. a senior fellow with Georgetown University’s Berkley Center for Religion, Peace, and World Affairs. His second book, Reinventing Bach, is out this month from FSG. Paul Elie has been writing and editing in the publishing industry since 1987, always and consistently, as far as this interview details, moving up in the world. It would appear that finally he has "made it" and is likely more successful than he imagined he would be. He has become an institutional voice. Further, Paul Elie is a Catholic whose book on Catholic writers, with a title taken from a Flannery O'Connor short story, "The Life You Save May Be Your Own," was extremely successful and placed on many "best Catholic books" lists. It was Beliefnet's 2003 "Book of the Year." In an interview there it is clear that Elie is a man trying to live his faith and promote that way of being. He says of the subjects of his book, "These people were trying to make points with their whole lives." What point is a representative of the Catholic faith trying to make with "The Homeschool Diaries?" The entire piece, all 1,400 words, is pure "everything-and-the-kitchen-sink" "dog whistle" for an "anti-government," "tribal" reader. It is frankly an embarrassing piece of writing if we judge it from a literary standpoint. As indicated, it is less than subtle. Each of its twelve paragraphs can be read as a 12-step program designed to bludgeon one with ideological cliches. 1. City government is incompetent. The body in question is the city Department of Education. The city redrew district lines and his kids were then denied access to a "gifted" program (Elie's quotes). 2. City public school officials are criminals and/or inexperienced and/or incompetent. 3. His wife, Lenora, can stay at home, join like-minded groups, and educate their child (bolstered by Elie's "curricular" abilities as a writer and grad-school instructor) instead of working to pay for private schools. In effect, Elie is the Principal and Lenora is the labor. 4. Homeschooling's not just for religious traditionalists. This is Elie's redescription of "fundamentalists." His gang includes professors, composers, restauranteurs, and even someone who seems to be blue-collar, though given a full title to make him more like Elie, a "Columbia University physical-plant supervisor." In other words, a manager. 5. a) Public schools are underfunded, overcrowded and "perpetually in turnaround." b) Public schools force questionable and irrelevant testing on students. c) Up-scale gentrification--moving middle class whitey out of neighborhoods--is driving up real estate in those districts with "good" public schools (how can there be any?). 6. a) Private schools are unaffordable. b) Catholic schools are being undercut by their "poor relations," parochial schools. 7. Homeschoolers have all kinds of reasons, but most of them are to Elie, "high culture" reasons set beside the "public schools' emphasis on standardized testing" to the detriment of an arts education. 8. You already, if you live in someplace with high culture (ehem), supplement your poor, public school education with cultural outings. 9. Elie's "day"--math at home with dad first thing; then it seems as though dad goes to work off-site at an office space (that must be pricey); Lenora, teaches the rest and they then go culture site-hopping. 10. These cultural sites are often free! (um...paid for by tax dollars). Then he lists great instructive opportunities offered at bargain rates compared with private school per deum rates. 12. What about the future? We already are teaching our kids like a college curriculum so what's the big deal? So, how does this say more than this: If you can afford it, if you live in a city, if you are educated, if your friends are educated, keep your kids out of the public school system. Is this good advice? I won't argue with one man's particulars. We all SHOULD consider the ways we live our lives as families. But isn't this action designed in the main to remove as much "value" from the public school as possible? And what of the non-Elie's ("Are they my poor?") who cannot fit this cultural template? What is a public system for? Without it, what do we envision happening? Imagine, in a city like New York, the entire school age population NOT going to school but staying at home, taking field trips, etc. Is that viable? So, when confronted with this "practical" approach to "learning" we should probably ask why Paul Elie doesn't want to reform public school education and share his immense capabilities with more than his tribe. Why isn't Paul Elie running for school board or local office? Because many of us would agree with much of what Elie has written regarding the troubling situation of our public schools. These are not to be "fixed" by the Elie's of this world. They are to be erased. And as social management must have institutions like schools to do the automatic work of cultural indoctrination, what would schools, once destroyed and bankrupted, be replaced by to serve that institutional role? You know there was once a more thoughtful, deeper, more caring man named Paul who also disagreed with mandatory schooling and the industrial processes favoring a political indoctrination based on an economic system. Paul Goodman was his name. Here are some of his thoughts to counterbalance Elie's "pragmatism" of class interest. To adapt a line from Thoreau, a tactic I've used most of my writing life, I do not ask at once for no school, but rather a better school. On evidence in "The Homeschooling Diaries" is the confusing of the abstraction we call "school" with the politics that direct it (give it instructions in behavior). Elie says several times that the Public Schools are failing because of "their" emphasis on this, that and the other. The error seems intentional. Public Schools, their organization, their content, their mandate, their policies, their operations, are under the direction of managers beholden to city, state and federal directives. Therefore the schools do not emphasize testing, the politicians do. Public schools do not "gentrify" neighborhoods, politicians do (at the behest of campaign donors). Public schools do not redraw district lines and force you to pay more rent in order to go to the school you deem the "right" kind of school...politicians do. Politicians are now best defined as individuals with the position in society most advantageous to aiding their own material existence and furthering their own, and the "master class," ideology. They direct us how we should properly live according to race, class, culture, creed. That is, the school is simply a reflection of the cultural instructions dictated by the powerful. Elie, begins his piece by offering himself as coming to homeschooling passively--it "happened" to him. He claims his wife wanted it and then that city government and real estate economics forced his hand. In one paragraph he claims he wanted to stick with public schooling because he "had been raised on the cult, creed, and dogma of public school, and this [homeschooling] felt like leaving the fold." That is what we might term "ironic" coming from a man who is trying to live his Catholic faith in his work (writing and teaching and directing others). But, it does seem to me to be the most explicit reference in the piece by being truly the least obvious and most subtle. Paul feels he can create (recreate?) his religio-cultural tribe by enveloping himself and his family in a self-selected community of "sameness" and he specifies the church as one of his primary community locations. I have no issues with this in the least. I do find it particularly narrow and as a man with no need to make God my normative regress (my "final answer") I find it liable to lead to an intolerance that wields its effects in a cash imbalance. My "regress" makes more than your "regress." My regress can beat up your regress. The question, what about the rest of us?, never seems to enter the equation anymore but for the high abstraction, noted elsewhere, of human capital. Something akin to Temple Grandin's cows who are happy all the way through their brief and humanly-determined existence. They taste better that way, quoth she. Also, are the people useless? The concept of efficiency is largely, maybe mainly, systemic. It depends on the goals of the system, which may be too narrowly and inflexibly conceived; it depends on the ease of administration, which is considered as more important than economic or social costs; but it depends also on the method of calculating costs, which may create a false image of efficiency by ruling out "intangibles" that do not suit the method. One feels a truth in Paul Elie's desire not to be at the whim of the state and the state's bureaucracies; and further to minimize the intrusion of "Education" companies like Pearson and ACT into the brains of our progeny. I want community, public education. I want a "homeschool" attitude within it. I want a teacher who knows more about content than I do but doesn't assume he or she knows more about my children and the proper way they should learn. I want a collaboration. I do want more "homeschooling" in my public school. I just don't want to promote the segregations of sameness; these are the same as segregations of difference. Perhaps you'd like to have Paul Elie's wife and friends teach your child. You know you can't. But why can't you have a "Paul and Lenora"-type public opportunity? It's an important question we should try to answer and thank Paul for raising, even if Paul meant something else by his article. I think homeschooling is, in a way, the purest form of education inequality. I was homeschooled for a year in 2nd grade, and I understand why families might choose to do it, but homeschooling does not at all represent the future of education. 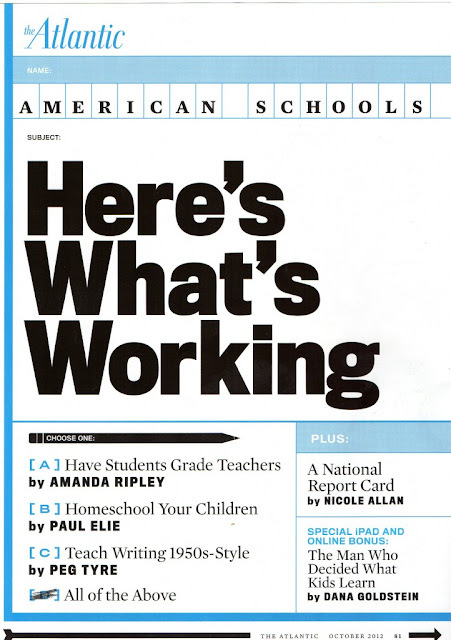 I agree with the author that there are elements of homeschool philosophy that would be great when applied to schools, but in the end the country needs a public education system that will cut across class lines and bring together children of all backgrounds into education communities. @Storm: "I want community, public education. I want a "homeschool" attitude within it." That is the key. As a public school teacher, I am not afraid to say that many if not most homeschoolers are much better off being homeschooled than they would have been in school. We need to figure out how to make regular school more like homeschool. (I once wrote about a student I had who was homeschooled until her senior year: http://literacyinleafstrewn.blogspot.com/2012/05/is-explicit-instruction-valuable-or.html). Many homeschool parents are following John Holt, Ivan Illich, and so on, and are natural enemies of corporate-style ed reform. We teachers should be their allies. Hi, EC, Thanks for the comment and the link to your piece. I think the comment below in response to Prof Skeels would be appropriate here as well. The question isn't really what can we disdain, because we must understand that many of the folks we believe are "ignorantly" creationist came through public schools and likely took science classes. We are arguing at cross purposes if we believe this is about sustaining an institution. My take on Occupy was (Is) that it's the obeisance to institutional conventions that keep us "believing" in those folks who are taking us for a ride. Homeschooling says to me...let's keep our struggles close to home, let's understand the battle in our home towns, let's say no to a managerial/institutional intrusion that is no longer explanatory or exemplary. Hi, Peter, thanks for commenting and sharing your experience and thoughts. It seems to me as if homeschooling might indeed represent the "future of education." What this philosophy contends is that each tribe should look to its own representations of reality and pass these on to other tribe members. This will be easier and easier to manage via our ever-expanding "communications" technologies. My greatest wish is that this urge to NOT be manipulated by the state or economic pressures to conform to class ideologies be carried forward with the intention of sharing and blending homeschool communities with enough energy and force to create a new version of a locally-run school that is NOT a system and does not try to replicate abstractions and instead encourages the face-to-face interactions of homeschool communities. In other words, to desegregate via homeschooling philosophy--to cross the invisible economic barriers in cities that seem erected from one block to the next. I wrote the following in an email to a friend who has been working to salvage a community-run school in Indy. The group is already talking "hierarchy" in management of the teaching and operational decision and he is despairing as the community has done so much to mitigate the vicissitudes of "leadership:"
I'm not sure that we're missing an opportunity to dismiss the institutional coercion that keeps us fighting for an "obedience center" rather than a locus of learning and human community.